What is the El Niño Spanish Lottery? The El Niño is an annual lottery that takes place on 6th January in Madrid, Spain. The El Niño is known for creating huge jackpots and in Spain is second only to the huge El Gordo Spanish Christmas Lottery. The estimated prize pool for this draw is currently €630 MILLION (approx. £560 MILLION). El Niño is a national holiday in Spain that celebrates the arrival of the three kings. It was traditionally when Spanish children got their Christmas presents. The El Niño lottery represents a second chance for a big Christmas lottery win for many Spaniards. If they win their stake back as a prize on the El Gordo Christmas Lottery, they will very often “reinvest” it back into the El Niño! El Niño works more like a raffle than a lottery. There are no lottery balls; instead, there are two huge drums that contain all the purchased tickets – just like a raffle. The total prize pool is broken down into prize “tiers”, each with a varying number of prizes on offer. More than one person can buy the same ticket In the El Niño, there are multiple copies or “series” of tickets, which means more than one person can have the same ticket number. There are 45 “series” in total, so 45 sets of tickets from 00000 to 99999. This means that up to 45 people can potentially have the same ticket number and EACH win the ENTIRE first prize of €2,000,000 (approx. £1,700,000). You can buy shares of ticket numbers Each ticket is made up of 10 shares, meaning you can actually buy a 1/10th single share of a ticket, otherwise known as a décimo. This costs 1/10th of the usual ticket price and returns 1/10th of any prize it might win. If a ticket number wins the first prize, then the holder of a “full” ticket would win €2m (approx. £1.7m). A player that holds only a single 1/100th share of that bet would win 1/100th of the prize – €20,000 (approx. £17,000). How does betting El Niño at Lottoland work? At Lottoland, you are betting on the outcome of the Spanish El Niño Lottery draw and the results of it for 2018 can be found here. You choose a five-digit number between 00000 and 99999 that you think will be drawn at the official draw in Madrid on 6th January. How do I bet on the El Niño at Lottoland? Click on the El Niño Lottery tab and then start by choosing your number. This is a five-digit number from 00000 – 99999. Next, choose whether you want to place a full bet or a share of a bet. A full number costs £249.99, but you can place a 1/100th share of a bet for as little as £4.99. How much does it cost to bet on El Niño at Lottoland? The cost of your bet will depend on the bet share you decide to place. However, the larger the bet share, the more you save. For instance, if you purchase a full number, you’ll pay just £249.99– a huge saving of 50%! As an example, if you placed a 1/5th bet on the El Niño Lottery, it would cost you £92.00 and you could win a maximum jackpot of €2m (approx. £1.7m) divided by 5, which would be €400,000 (approx. £350,000). What are the odds of winning the El Niño jackpot? The odds of winning the €2,000,000 jackpot (approx. £1,700,000) are 1 in 100,000, far lower than on any other multimillion pound jackpot draw. Over 1 in 3 numbers will win a prize of at least €200 (approx. £170)! Please bear in mind that the prize values shown below are estimates and subject to currency fluctuations. The exact value of the pounds sterling prize will depend on the euro-to-pound exchange rate. How does DoubleJackpot work on the El Niño Lottery? The DoubleJackpot on the El Niño Lottery allows you to bet for twice the official amount on the first three prize tiers for double the price of the bet. For instance, if you won the first prize tier having purchased a full bet share, your bet would cost £499.99 instead of £249.99, and instead of winning a €2m jackpot (approx. £1.7m), you would win €4m (approx. £3.4m). 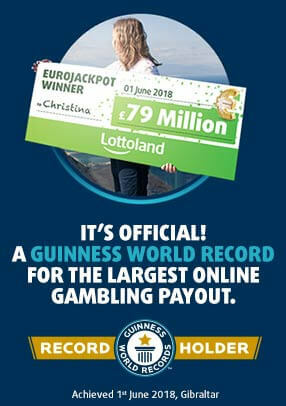 It’s worth noting that Lottoland’s DoubleJackpot feature typically applies to the first prize only. Being in with a chance to win DOUBLE the first three prizes of the El Niño Lottery is a fantastic feature you’d be mad to miss out on! If your account has been verified, simply proceed to your account and withdraw your winnings. If your account has not been verified, you will first need to provide proof of ID and proof of address. Once this has been confirmed, you will be able to withdraw your winnings.